The most exciting thing to happen to me this week was my MUA order being delivered - I think I need to get out more. I was truly excited to get these as I never tried the caviar manicures that were out a while back as the price just seemed ridiculous. 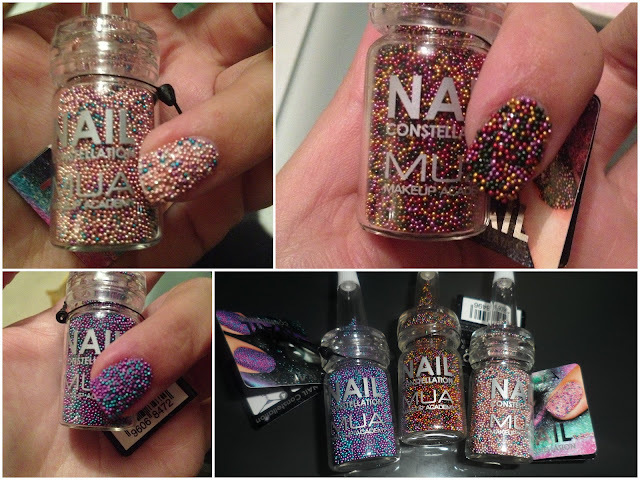 The MUA nail constellations are just £3 each, so I bought three of the five colour choices available. 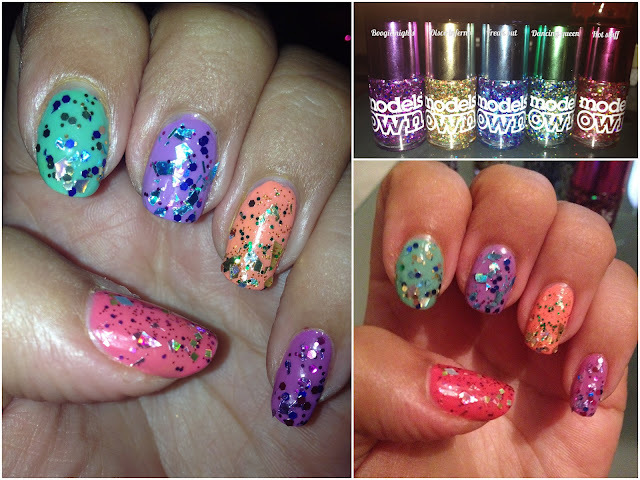 I wanted to try these out as soon as they arrived, so I did one nail of each of the colours I got. The first thing I noticed is that the colours are much nicer in real life than I was expected. I'm annoyed that I didn't also buy the Pisces version as I picked that one up for my friend and it looked lovely whereas from looking at it online I thought I didn't need it as it seemed too similar to Gemini. This is the full range below. Applying the nail constellations was really easy. 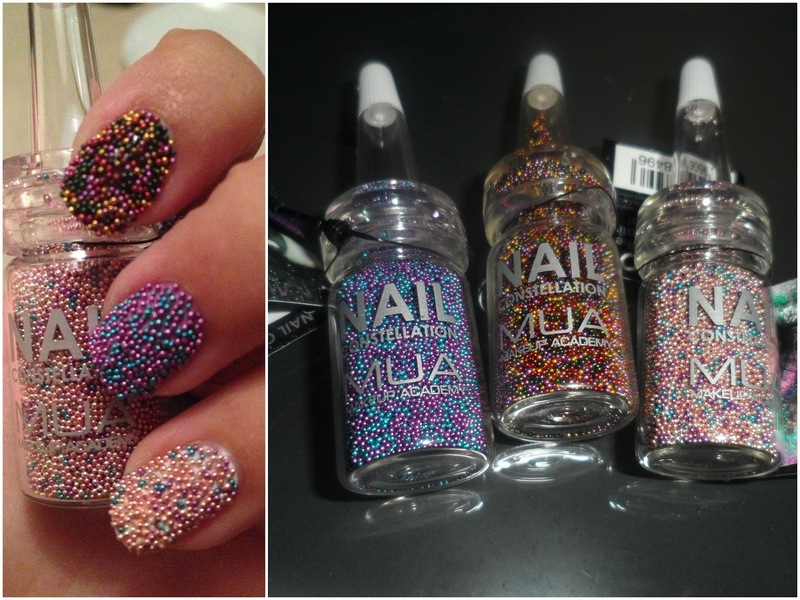 You just apply any colour polish you like and then pour over the beads while the nail varnish is still wet so that they stick. I had a little bowl to catch the excess beads and it was fairly easy to pour them back into the bottle as the lid doubles as a funnel. I did lose some on the floor though - it can't be helped because they're just so teeny. I applied Scorprio (rainbow effect beads) over black, which I think made the colours really stand out. I think this one is quite Christmassy and perhaps applying it over red would make it even more so. For Leo, which is made up of purple and turquoise beads, I applied a lilac base coat. This makes the purple stand out more and I'm sure it would do the opposite with a turquoise or greeny base, which I think I'll try next. Gemini has lots of pretty pastel colours in it, but it's predominantly pink. I applied it over a white base for the swatch but then when I decided to wear it out the following day I tried it over pink but I could hardly tell the difference. So this is how I wore Gemini to go to a party last night. I was really pleased with how it turned out. My swatches from the night before had lost some beads by the morning, so I decided to try out adding a top coat. I was a bit apprehensive about adding top coat and potentially ruining the nails I'd just done as I read another review which said that the top coat caused the beads to stick to the brush in a gloopy mess and to change colour. Luckily though, I didn't have the same problem. In the second picture where you can see both of my hands, the hand underneath has topcoat on the constellation nails and the hand on top doesn't. You can hardly see a difference other than that the nails with the top coat look a bit smoother. I didn't get any colour change at all - perhaps this would happen with some of the deeper colourways? Also I didn't have a problem applying the top coat so my tips would be to allow the nail constellations to dry into your base colour for a while before applying your top coat and then to apply a really generous layer so that the brush literally doesn't have to touch the beads. That worked well for me. As for staying power, these are a one night wear kind of deal. I expected that and I'm fine with it. I did find that I needed to be quite careful with my nails when wearing these - I had a little incident when putting my jeans on that caused the beads on my index finger to scrape off. The top coat and base colour had glued them all together so fortunately instead of having to start again I was able to smooth it back on to my nail and it actually stayed. Lots of people noticed my nails and asked about them while I was wearing Gemini, so I think they're going to be really popular. I don't think you can go wrong for £3 either. Here they are in all their tempting glory - gourmet salted waffle pretzels with cinnamon bun dip. It even sounds naughty, don't think of the calories. These awesome snacks are from Cyber Candy's Hammond's American Vintage range - I dare you to have a browse and not get the munchies when you scroll through heavenly treats like white cholocate peanut butter cup dip, s'mores chocolate bars, and gingerbread candy canes. I brought these treats out when I had some friends round at the weekend and they loved them. I blame them for the poor quality of my flash-back photos - I had to snap quick before their greedy little hands got in the frame. I know it's mean, but I'm starting to regret having shared them, I could have easily munched the whole lot myself. The waffle pretzels (£4.50) were light and crunchy with a hit of saltiness which contrasts perfectly with the super sweet and seriously cinnamonny gooey dip (£7.99). We just don't get the salty-sweet thing right over here like they do in America. Eating these reminded me of a salted caramel frappucino I had on my holiday - I need my salty-sweet fix! 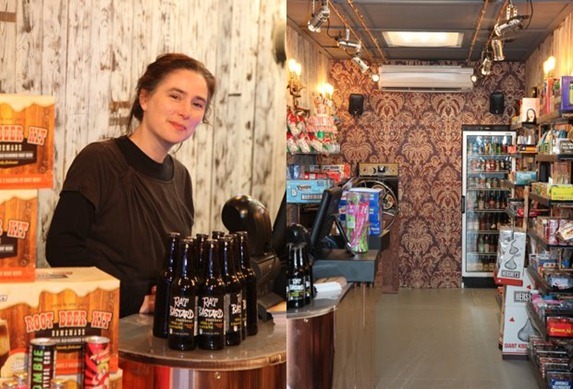 You can take a peek at the full Cyber Candy range online here, or if you're about in Shoreditch, East London you can check out the new steampunk themed Cyber Candy Boxpark store and have a sniff and a lick of the goods for yourself. Ahh the mirror balls :) From the first glimpse on the Models Own facebook page I knew I had to own them all. I even stalked them online while I was on holiday to make sure I got my order in before they sold out. I think I might just be addicted to glitter! Here I've shown the full range of beauts over a plain white and then a plain black. I thought I was going to like them over white best, but actually, the black really intensifies the glitters and shows up the intricacies that are lost on a white background. The white makes them girlie and sweet but black makes them look firey and somehow galactic - I like! I also decided to try them over similar background colours and they wowed me again. There's an actual party going on right here on my nails. I used quite bright colours for my base shades here but I've also just seen them over pastel colours on this blog and they look ahh-maazing too. The mirror balls have not disappointed me. I really like the different shapes and sizes of glitter - it makes them much more interesting than a standard glitter polish and I'm going to be using them a lot as top coats to jazz up some of my unloved polishes. I also find they stop my polish from shipping so easily - I think it's something about the rougher texture - definite bonus. 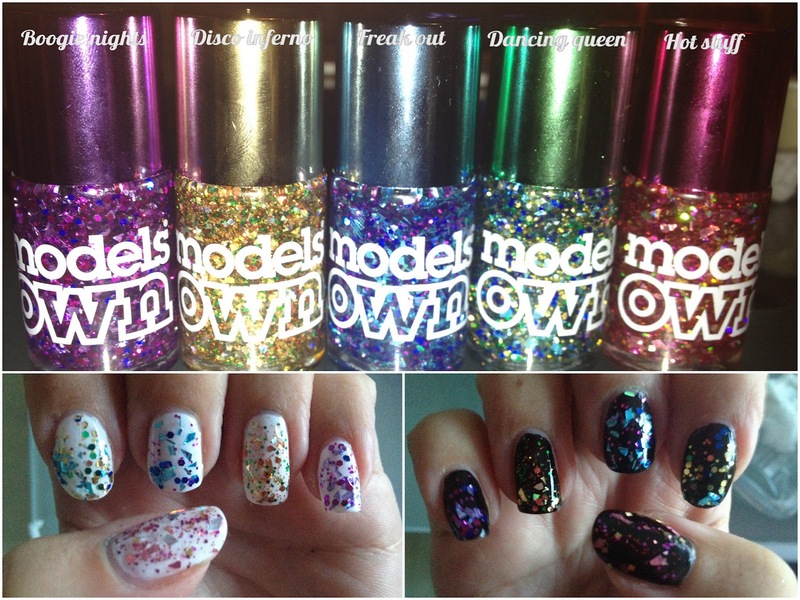 I bought these in a set where you get all five mirror balls and a top coat for £20 from modelsownit.com. The set is currently sold out, but you can still buy the polishes individually. There's also now a 50% sale going on until 2 October with the code SUMMERSALE. Rather than the usual 'what's in the box' type beauty box post, as I got both a Glossybox and a She said beauty box this month, I thought I'd pit them against each other and do a comparison of the September boxes. First of all, looking at the packaging, both of the boxes are really pretty to look at and are ones which I will keep to store bits and bobs in. Glossyboxes are usually a pale pink, but every now and again they change up the colour of the box to match the theme of the contents. This is the first time as far as I know, that they've had a patterned box and this one was designed by Maggie Li. I think it's a shame this theme didn't continue onto the inside - the black tissue and shredding almost clashes with the pretty outer box - I'd have loved it more if that had matched the overall colour-scheme. As for the She said beauty box, I think the hot pink and bright turquoise are their regular brand colours and I really really like them - the subtle fleur de lis pattern on the box and on the sticker appeals to me too - this is how I'd design my own beauty box if I had the chance. The one thing I don't like is the straw like shred - the visual effect is lovely, but bits of it got everywhere despite me carefully trying not to drop any. Not a bad list of things to try out in my opinion. The addition of the crisps stands out as being a bit odd to me - I'm not sure how they relate to beauty, but maybe they're just a little extra item as I got six products in the box in total. There's nothing in this box I wouldn't use. In fact I've tried the Ginerva product before and loved it, and the two Collection products are ones I'd been thinking about trying. I got the same cleansing oil in another beauty box and haven't got around to trying it yet - I'll be able to give it more of a try now that I have double the sample. From reading other people's posts on the September She said beauty boxes, it seems that everyone gets the same contents. I'm not 100% sure on that, but I couldn't find any posts with a single different product. I can understand why it's not always going to be possible for everyone to get the same contents because of the large numbers, but I do think it's a plus point if this is the way She said beauty operate. We can't help being just a little bit envious when we see someone else got a full size or high end brand product in a beauty box and we didn't, can we? In complete contrast to the She said beauty box, I've been unable to find another blog post with exactly the same September Glossybox contents as me! I saw lots and lots of completely different ones. Some included a full size Mythic hair oil, which a lot of people seemed to be saying they wanted to get in their box. I'm not too bothered as I have tried other hair oils, and I quite like the contents of my box - all of the products are something that I will use. I'm always slightly disappointed to see a perfume sample in any beauty box as I tend to think of them as something you could get for free in a department store. Although I was interested in having a sniff of Gaga's new scent and hadn't gotten around to it yet, so I'm happy with this. Another thing I don't usually like in beauty boxes is tiny sample sachets as again they seem like something you might get for free, and it's not really enough product to try it out properly. But, as these are Rodial samples, which is a brand I've heard really good things about and wanted to try, it's okay. Actually having looked up about the snake serum (slight scary sounding but super intriguing!) apparently you can see the effects with one application, so two sachets may well be enough to show me what the product can do. I'm really looking forward to trying these. So overall I liked both of the boxes. I love Glossybox's limited edition box design, but I prefer She said beauty's general theme colours. As for contents I'm pleased with both sets of products, although it does feel like I got slightly more from the She said beauty box as most of the items are larger sizes. Glossybox subscriptions cost £12.95 per month including p&p and She said beauty is £11.95, although both boxes were sent to me for consideration this month. Which is your favourite beauty box subscription? I've heard before that the type of water that comes out of our taps (whether it's hard or soft) can really effect our hair, but I didn't know there was anything you could do about it until I heard about a range of shampoos and conditioners called Area H20. Water types affect hair in different ways so AreaH20 has been developed to work with your water type. In hard water areas like where I live in London, metal ions react with your shampoo to form mineral deposits that cling to the hair. This means hair becomes rough and hard to untangle because insoluble salt residues (limescale) remain in your locks after shampooing. I never knew this before, but it is true - my ends can get really rough and my hair is often an nightmare to detangle too. AreaH20 shampoo for hard water is designed to act as a magnet for the mineral ions so that they wash away far more easily leaving cleaner, smoother, shinier and less flyaway hair. I've enjoyed using these products and I've learned a lot more about water types and the effect they have on our hair by trying them out. The shampoo was really pleasant to use - it lathered up easily and both the shampoo and conditioner has a strong but nice fragrance which reminds me of a shower gel my boyfriend uses. My hair feels really clean and manageable after using these, although I generally would need to use a more intensive conditioner for my hair than this as the ends do get really dry. This is the last post in my holiday favourites series. Sorry if it seems like an odd time to be banging on about holidays when Christmas things are already hitting the shops, but I nearly always go on holiday in September! My last post is about the conditioning products I took away for my hair. Although I have oily roots, I have dry ends which can get totally frazzled in the sun and turn a bit straw-like if I don't take care of my hair with some good products. I've blogged about the Dove nourishing oil care express treatment conditioner before - it's one of my favourite conditioners which I buy again and again. When I was picking it up this time, I noticed a new addition to the range which is this leave in conditioning spray - it seemed perfect for sorting out holiday hair, so both came along with me. After washing my hair in the shower I squeeze as much water as possible out and then I apply a big dollop of the conditioner to the ends and mid lengths. I then leave it on while I wash my body and face before rinsing it all out. I like that I can give my hair a treatment with this without having to spend ages with the product on my hair. I used the leave in conditioner after towel drying my hair. It made my hair really easy to de-tangle and I actually let my hair to dry naturally nearly every day, which I hardly ever do at home. It's always easier to dry your hair naturally in hotter climates, but it can still ends up really frizzy. The leave-in conditioner left my hair pretty smooth looking with hardly any kinks or fluffiness. I've even used it back at home when leaving my hair to dry naturally at the weekend, and it works just the same, even though it takes a few hours to dry here! The Dove nourishing oil care range also includes a shampoo, a regular conditioner and a hair mask and they're all currently available on 3 for 2 at Boots. I mentioned these in some of my previous posts about my holiday, but as this is a series on holiday favourites, I can't go without another mention about my sun care. It's the Etat Pur after sun gel, peptide pro-melanin and facial sun cream. Etat Pur has developed the first Biomimetic range of sun care using ingredients that have been selected to be in perfect affinity with the skin. It uses unique formulas, exclusively composed of mineral filters, to provide optimal sun protection which is perfectly safe for the skin, even for those sensitive or allergic to organic chemical filters. I used the peptide pro-melanin for a few days before my holiday and then while I was away too. It's designed to get your skin prepared for the sun and to help it start producing melanin which is what happens in the sun when you start to tan. The idea is that you'll tan faster than normal by using the pro-melanin product. It's hard for me to say whether or not this sped up my tan - the only true test for that would be for me to have perhaps applied this to one arm and not the other, but I didn't fancy an un-even tan! What I can say is that I started to pick up a tan even on the first day of my holiday. I also used the facial sun cream every day while I was away. At spf 30 it's a higher factor than I use on my body, but it's perfect for the face. When I was younger I was so obsessed with getting a good tan and I really didn't think about the effects sun damage on the face causing nasty wrinkles. These days I prefer to use a high factor and I keep my face in the shade a lot - I'd rather fake it on my face than end up looking like a prune! The after sun soothing gel was a product the boy and I could share. I don't really burn very easily, but I still like to use an after sun to add moisture back into the skin and it's a lovely way to cool down and refresh after a hot day in the sun too. This after sun was lovely to use as it gave that cooling sensation and left the skin feeling hydrated and soft. All of these products are available from etatpur.co.uk. When I'm at home I mostly use my epliator as I find that's on of the most convenient methods of hair removal, but it doesn't work on holiday with the different power supply. Of course I take care of the fuzz before I go on holiday, but when you're away for two weeks, stray hairs are going to pop up so this year I was well prepared with Nair's brazillian spay clay range. I got to try out the body wax strips which are perfect for legs. After spending the day on a sun lounger spotting little hairs creeping up it was nice and easy to use a few of these strips to make sure my skin was nice and smooth again. The strips aren't gooey and messy like some I've tried - they actually left hardly any wax behind on my skin, and what was there was easily wiped away with the post-waxing wipes which were also really moisturising. The facial strips were great for any annoying little hairs above my lip (the ones we all like to pretend we don't have right?) and grabbed even the shortest hairs. I'm pretty good when it comes to waxing, I don't find it too painful and actually get a weird little satisfaction from ripping off the strip, but I do draw the line and wimp out when it comes to my under arms. If I gave it a go it would probably be okay, but it's a little phobia I have, so for that area I reached for the shower power cream instead. If you've not used on of these before, they're so easy. You just smooth on the cream over the skin where the hair is and leave it for a few minutes before showering it off. My skin can be sensitive to hair removal creams, so I never leave it on quite as long as the instructions say, and that way I don't get any sensitivity issues. It smells a lot nicer than some other hair removal creams I've used too! You can pick up the Nair brazillian spa clay range at Boots, Asda, Sainsburys and Tesco. The Body wax strips are £6.69, the facial strips are £5.69 and the shower power cream costs £6.69. I'm a bit of a hand cream addict. It's a product I really can't live without and I always have various tubes on the go which I keep in my handbag, on my desk at work, by the sinks in my house and next to my bed. So when L'Occitane sent me some their new Bonne Mere gentle creams to try I threw one straight into my holiday flight bag to take away with me. These creams are from L’Occitane's new Bonne Mere range. 'Bonne Mere' is an expression often used in Provence to express joy, a stroke of good luck and kindness. The range comes with two different bases, honey or milk, that are both super creamy and gentle. Although I tool the milk gentle cream away with me on holiday to use as a hand cream, it's actually suitable for the face and body too. I got through so much of this on holiday as my hands were feeling really tried out from all of the sun, air conditioning and chlorine from the pool. It sinks in quickly and is immediately comforting on the skin and it leaves a subtle milky creamy fragrance. I'm looking forward to starting on the honey version now that I'm back. On my way back from holiday, I knew I had a big exciting package waiting for me as my brother was collecting my post. What better treat to come home to than a massive jar of sweeties with a lovely new perfume hidden amongst the yumminess? 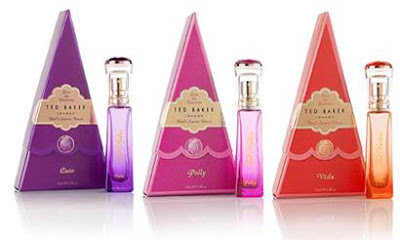 Ted's Sweet Treat is a range of three new purse sprays which have just launched and I got to try out the sweet smelling pink one called Polly. The purse sprays are a 10ml size for £15 each and I think they'd make really cute gifts for birthdays. You hardly even need to wrap them as they look like cute slices of cake or possibly like ice cream cones, but hiding them inside a big jar of sweeties to give them as a gift works well! Cate with notes of peach, apple and orange, melting to a heart of violet and jasmine, everything you need for instant confidence. Vida is infused with exotic grapefruit and raspberry with a heart of wild rose. Laced with a hint of plum and a dash of musk, it's impossible to not be in a good mood with Vida. Polly is fabulously fruity with top notes of mandarin, red berries and peach, her heart belongs to white jasmine, honeysuckle and peony. With a dreamy twist of amber and vanilla. Although the perfume is a purse friendly size, it's still in a beautiful bottle - I love the big gem design on the lid. It reminds me of some of the Ted Baker jewellery which was out a little while ago. Polly has top notes of mandarin, red berries and peach, a heart of white jasmine, honeysuckle and peony, with amber, vanilla and white musk. My nose isn't sophisticated enough to pick out all of those but I can definitely smell the vanilla and a mix of lovely sweet florals. Ted's sweet treat purse sprays are available now from Boots and Ted Baker stores and will also be sold online soon. Next on my list of products I used and loved while I was away on holiday is a face wash. To save packing space I took one that the boyf and I could happily share - Clearasil daily clear vitamins and extracts wash and mask. The boyf always uses a spot fighting type of face wash, but most days I don't. I usually use quite a creamy cleanser, but on holiday I knew I'd be getting really hot and sticky in the heat so wanted something that would keep any potential spots away and keep my skin matte. This meant we could share a product, and because this wash doubles as a mask too, it was super space saving for my always bulging suitcase. The Clearasil daily clear wash felt pretty gentle on my skin, which surprised me considering it's an anti-acne product. It's got a creamy formulation, and smells lovely and fruity (avocado and pomegranate), so it wasn't far off from using one of my usual creamy cleansers at all. It's great that you can also use it as a mask by applying a thicker layer and leaving it on for a few minutes. I've tried a Neutrogena wash / mask like this before and really liked it too. The Clearasil Daily Clear range is available at Boots and the Wash and Mask costs £4.99. So I'm back from Vegas and I want to share with you my favourite products that I used while I while I was away. First up, the body moisturiser I took with me - E45 silky radiance. Skin can get so dry in the sun, plus with all the air conditioning I was subjecting myself to, I relied on this heavily. I did use an after sun too, but I used this moisturiser even when I hadn't been in the sun just to rid my skin of that tight feeling it can get when it's too dry. I never need so much moisturiser when I'm at home, but really noticed my skin getting dehydrated in the dry heat of Vegas. The E45 silky radiance worked perfectly for me on holiday. It's not so heavy that you have to wait ages or it to sink in and it didn't leave any stickiness - it just made my skin feel hydrated and comfortable. I also liked to subtle shimmer than this gives to the skin - unfortunately my camera hasn't picked it up but in real life it gives a lovely sheen that just makes the skin look healthy and bright, especially once you're a little bit bronze! You can pick this up at Boots and it's £3.99 for 250ml. I'm back from Vegas and not missing it quite as much as I expected - I'm actually enjoying being back at home. That said, Vegas was amazing and I had a brilliant time. I'll go into a bit more detail and post some proper photos once I'm all sorted out, but for now I thought I'd share a few pics from Instagram to update you on my adventure. I hope you enjoyed the guest posts while I was away. A huge thank you to the following lovelies for guest posting for me - please check out their fabulous blogs.